Jared Nelson, assistant professor of mechanical engineering, appeared on the Jan. 25 episode of WAMC’s syndicated program, “The Academic Minute,” to share research into the energy-saving potential of using natural fibers (such as flax, hemp and kenaf) instead of synthetic fibers in industrial processes and products. Nelson describes the work of the new Bio-industrial Materials Institute, a partnership between SUNY New Paltz, Union College and RPI, which is studying the mechanical attributes of natural fibers in hopes of better understanding their potential industrial applications, and empowering farmers to add sustainable and profitable new crops to their rotations. “The perils of a fossil fuel-based economy are woefully evident; however, fiber materials from bast fibers such as flax, hemp, and kenaf offer comparative reduction in energy and CO2emissions when considering replacement of existing traditional synthetic materials,” Nelson says in his radio essay. 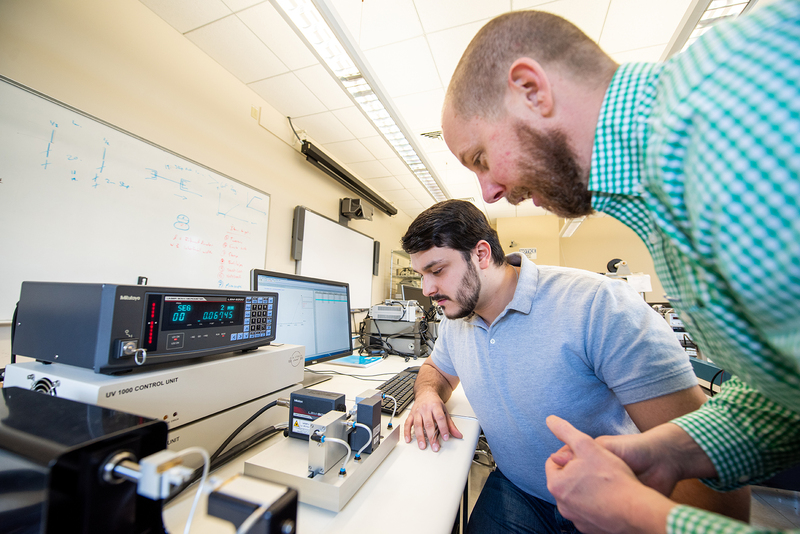 Nelson received a 2017 grant to support acquisition of equipment that allows him to test the structural properties of natural materials right here on the New Paltz campus, which has already created opportunities for students to conduct impactful research in his lab. Use this link to access the complete recording and transcript Nelson’s “Academic Minute” broadcast. “The Academic Minute” is an educationally focused radio segment produced by WAMC in Albany, N.Y., a National Public Radio member station. The show features an array of faculty from colleges and universities across the country discussing the unique, high-impact aspects of their research. The program airs every weekday and is run multiple times during the day on about 50 different member stations across the National Public Radio spectrum. For more information, visit http://academicminute.org/.